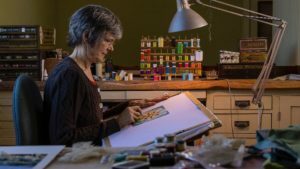 Hartford, CONN., June 5, 2017 – On Saturday, June 24 at 7:30 p.m., Connecticut Public Television (CPTV) will premiere Missy Stevens, The Spirit and Technique of Painting with Thread, a documentary about nationally acclaimed fiber artist and Connecticut resident Missy Stevens. The film will encore on CPTV on Sunday, June 25 at 4 p.m. and on CPTV Sports on Thursday, July 6 at 8 p.m. It is produced and directed by Rusty Dyer of DigiDyer Productions in Litchfield, Conn.
Stevens’ thread paintings are one-of- a-kind embroideries known for their rich color and playful spirit. In the film, she explains her discovery of the punch-needle and its use in fine art. Going beyond technique, the film reveals how her spiritual journey creates inspired imagery, connection to nature, and a sense of purpose. Stevens’ thread paintings have been exhibited in solo and group exhibitions in galleries and museums throughout the United States, including the Aldrich Museum of Contemporary Art in Ridgefield, Conn.; the St. Louis Art Museum in St. Louis, Mo. ; the Society for Contemporary Crafts in Pittsburgh, Pa.; the Museum of Arts and Design in New York City; and the Renwick Gallery of the Smithsonian Museum in Washington, D.C. She is the recipient of numerous awards and honors. She received an individual artist grant from the Connecticut Commission on the Arts and the Craftsmen Choice Award at the Smithsonian Craft Show in 2001. Connecticut Public Television (CPTV) is a media service of the Connecticut Public Broadcasting Network (CPBN). CPTV is a locally and nationally recognized producer and presenter of quality public television programming, including original documentaries, public affairs and educational programming. CPTV also includes two affiliate channels: CPTV4U, a 24/7 television channel featuring award-winning drama, news and talk programming, concert performances, independent films, nature shows, British comedy and more; and CPTV Sports, Connecticut’s only 24-hour local sports network, covering statewide high school sports. For more information, visit CPTV.org.